I am a 'poached eggs on toast for breakfast' kind of girl.I get the girls off to school then eat in peace.All too often though my egg either overcooks or goes cold. Whilst I get distracted by emptying the dishwasher or loading the dryer.I always end up cross with myself. Yesterday however my egg ended up both hard and cold and I couldn't have cared less! It was the postie who distracted me and look what she brought. A parcel from this lovely and talented lady. I love Tif's work it aways makes me wish I had thought of it! Have you seen her kitschy lamps? I really wish I'd thought of that! Anyway the parcel was full of vintage goodness but this combination had me whooping (yes, all alone in my kitchen I whooped!) Not very British I know. I really should be more reserved! 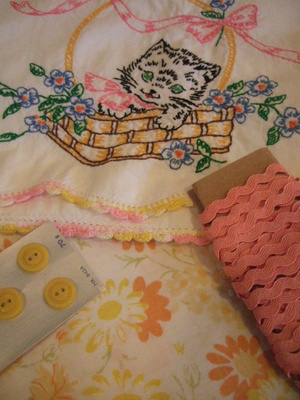 See that vintage kitty pillowcase? Too sweet. I just know it's going to cause arguments.I think a rota will be in order for who's bed it will live on. 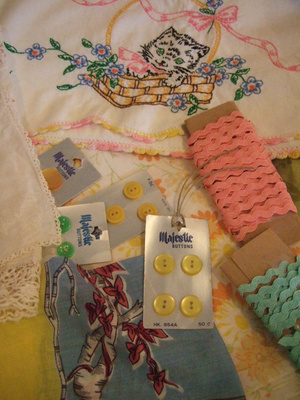 Vintage buttons and more vintage pillowcases then pink rick-rack. Got to love rick-rack I defy anyone not too. It's the law! Thank you Tif I love it all!